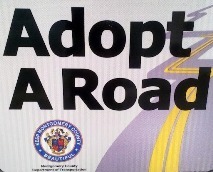 The Montgomery County Department of Transportation (MCDOT) sponsors the Adopt A Road (AAR) and Adopt A Spot (AAS) programs, encouraging individuals, clubs, organizations and businesses to regularly pick up trash from alongside more than 1,100 lane miles of roadways and at locations, such as parks, open spaces and right-of-ways. You will be helping us enhance the appearance of our community while improving our environment. Your cleanup efforts help us safeguard our waterways and protect the water supply. Roadside litter is a pollutant that can wash into storm drains that flow into our watersheds. The trash that ends up in nearby creeks and streams may eventually be swept all the way to the Chesapeake Bay, degrading water quality and harming our fisheries and wildlife. MCDOT recognizes volunteer efforts by providing signage with the group or company's name. MCDOT provides safety equipment and supplies, including reflective vests, cones, heavy duty gloves, trash bags and trash pickup sticks. MCDOT publicizes volunteer efforts through Go Montgomery! and AAR newsletters, on the MCDOT homepage, through press releases and at special awards ceremonies. What is Adopt A Road (AAR)? MCDOT sponsors the AAR program to help keep our neighborhoods attractive, clean, safe and litter-free. This program is an important part of the County’s state-mandated efforts to reduce trash in local waterways, enhancing the environment by improving water quality. Keeping trash from being washed into storm drains prevents pollutants from contaminating local streams and entering the Chesapeake Bay. Volunteers agree to remove accumulated litter and debris along their adopted road segment at least six times a year and to report their cleaning efforts to the Community Outreach office. Who may adopt a road? The AAR Program is open to individuals, nonprofit or civic organizations, businesses and governmental entities located within Montgomery County or that are active in Montgomery County. How is my participation in AAR recognized? MCDOT publicizes volunteer efforts through the AAR and Go Montgomery! newsletters, on the MCDOT homepage, through press releases and at special awards ceremonies. How do I find out what roads are available for adoption? View the AAR website for a list of road segments available for adoption. There are some restrictions on the type of road that can be adopted. Most road segments are about one mile in length. Volunteers typically adopt only one County-owned road segment at a time. Roads within municipalities or State-owned roads (designated by a route number) cannot be adopted through this program. For more information on the State’s Adopt-A-Highway program call 301-948-2477 or 301-572-5166 or visit the State Highway Administration’s website..
5. Can I adopt a shorter road segment? Some road segments at about one-half mile in length are available for adoption. Volunteers who adopt these shorter road segments agree to clean the roadway as well as any bus stops along the route a minimum of 12 times a year. What is the time limit for participating in AAR? Volunteers may opt to adopt a road for an unlimited amount of time as long as they meet participation and reporting requirements. How often do I have to pick up litter? AAR volunteers commit to cleaning their road segment at least six times a year, including one major cleaning in the spring. Volunteers clean the entire length of the road on each side from beginning to end. Do I need to report my cleanings? type of bag used (tall kitchen bag, lawn/leaf bag, grocery store bag or MCDOT orange bag). Cleanings can now be reported online! Who installs the AAR signs? MCDOT will install AAR signs at no cost to the volunteer that include a nameplate featuring the name of the volunteer, organization or business. Space limitations restrict the name up to two lines with 12 characters (including spaces) per line. Slogans, messages, phone numbers and website addresses are not allowed. Signs are not required to participate in the program. Why do I see different types of AAR signs? Standard AAR signs are purple. MCDOT also installs brown signs to designate rural and rustic roads. There is no difference in AAR program requirements for these roadways. The Maryland-National Capital Park and Planning Commission designates roads in Montgomery County as rural or rustic that are narrow, low traffic volume roads intended primarily for local agricultural use. This classification ensures that the rural character of these roadways is maintained. Learn more about rural and rustic roads in Montgomery County online and view a map showing their location. AAR has a partnership with Montgomery County’s Department of Environmental Protection (DEP) to recognize businesses that have taken voluntary steps to protect, preserve and improve the environment and are certified by DEP as a Green Business. AAR volunteers who are also Green Business participants are recognized with a special seal on their AAR sign. What happens if I don’t comply with program requirements? no cleanings are reported by the volunteer for six months. Do you provide equipment to help in cleanup efforts? MCDOT has a limited supply of cleanup equipment for volunteers, including reflective vests, heavy duty gloves, trash bags and trash pickup sticks. How do I dispose of the trash and recyclables I’ve collected? Is time spent on AAR cleanups eligible for Student Service Learning Hours? Yes, as long as an adult is present onsite who can certify the student’s participation. To participate in AAR cleanups, individuals younger than 16 years of age must be supervised by an adult. 15. What happens if I can no longer participate in AAR or have a problem with my adopted road? Notify the Community Outreach office. Are illegally posted signs considered litter? Yes. Volunteers can report illegally posted signs, including those on traffic signs, telephone poles and/or in medians to the MC311 Call Center by calling 311, 240-777-0311 from outside the County or online. If the sign is legal, it will display a permit number, usually on the back. Never confront a sign owner. What should I do if I encounter toxic or hazardous materials, large items or animal carcasses? Do not touch or try to remove materials that you suspect may be toxic or hazardous, such as batteries, powders, chemicals, smelly substances, suspicious packages, chemical drums or containers, weapons, syringes or needles, and dead animal carcasses. Report hazardous materials to the MC311 Call Center online or by calling 311 (or 240-777-0311 from outside the County). TTY users call Maryland Relay at 301-251-4850. If you find large items like appliances or tires, contact the MC311 Call Center online or by calling 311, or 240-777-0311 from outside the County. Report animal carcasses along a County road by contacting MC311 online or by calling 311 (or 240-777-0311 from outside the County). TTY users call Maryland Relay at 301-251-4850. 18. What else do I need to know before signing the AAR agreement? Volunteers agree to follow the program guidelines that are outlined in the AAR agreement. Click Here to fill out the AAR application now! 1. What is Adopt A Spot (AAS)? The program also enhances the environment by improving water quality. Keeping trash from being washed into storm drains prevents pollutants from contaminating local streams and entering the Chesapeake Bay. AAS and Adopt A Road are an important part of the County’s state-mandated efforts to reduce trash in local waterways. Last year, volunteers removed accumulated litter and debris alongside 1,100 miles of adopted roadways and spots. 2. Who may adopt a spot? The AAS Program is open to individuals, nonprofit or civic organizations, businesses, and governmental entities located within Montgomery County or that are active in Montgomery County. 3. How is my participation in AAS recognized? MCDOT recognizes volunteers by providing a sign displaying the volunteer name for posting at the adopted spot. 4. Who installs the AAS sign? MCDOT will provide the volunteer with a 10-inch (wide) by 7.75-inch (tall) AAS sign and post at no cost that displays the volunteer's name. The volunteer is responsible for both obtaining permission from the property owner to install the sign and the installation of the sign. No permit is required. 5. How do I find out what spots are available for adoption? 6. What is the time limit for participating in AAS? Volunteers may opt to adopt a spot for an unlimited amount of time as long as they meet participation and reporting requirements. 7. How often do I have to pick up litter? AAS volunteers commit to cleaning their spot at least 12 times a year. 9. Do I need to report my cleanings? 10. What happens if I don’t comply with program requirements? no cleanings are reported for six months. 11. Do you provide equipment to help in cleanup efforts? MCDOT has a limited supply of cleanup equipment for volunteers such as, heavy duty gloves, trash bags and trash pickup sticks. 12. How do I dispose of the trash and recyclables I’ve collected? 13. Is time spent on AAS cleanups eligible for Student Service Learning Hours? Yes, as long as an adult is present onsite who can certify the student’s participation. To participate in AAS cleanups, individuals younger than 16 years of age must be supervised by an adult. 14. What happens if I have problems or can no longer participate in AAS program? 15. What else do I need to know before signing the AAS agreement? Volunteers agree to follow the program guidelines that are outlined in the AAS agreement. Click Here to fill out the AAS application now! Dial 311, Monday through Friday from 7 a.m. to 7 p.m. or 240-777-0311 from outside the County. TTY users call Maryland Relay at 301-251-4850. Learn more about AAR and AAS and fill out an application today. 8. Should I maintain the landscaping at the spot? The volunteer is not required to maintain landscaping at the spot. However, if the volunteer obtains permission from the property owner, they may install landscaping materials and weed and water the site.